QUICK DETAILS- Offered daily from 1 pm to 3:30 pm- 5 premium single malt Scotch whiskies (2 of them very rare)- £5 discount for any 70cl bottle in our associate whisky shop- A complete storytelling experience highlighting curious and quirky facts about whisky- Walking tour visiting 4 of the fanciest whisky venues in Glasgow’s City CentreCome to join us in our Glasgow tour and whisky tasting through Scotland’s largest city. 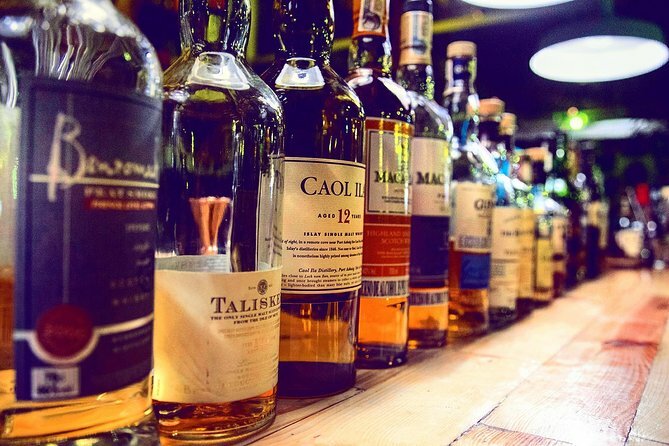 Our city centre whisky tour is a fantastic storytelling experience that focuses on curious facts and amazing stories behind distilleries, brands, and whisky makers.Come with us and discover how Glasgow has played such an important role in helping the whisky industry to kick off centuries ago. Learn how whisky has influenced famous musicians and filmmakers over history. Discover some other interesting facts about prohibition, smugglers, and moonshiners. Let us tell you about world whiskies from countries like India, Japan, Australia, and the US.